Understanding the unique needs of girls, ages 12 to 14, has led Oak Knoll to look purposefully at the total private, Catholic college prep program we offer for our seventh- and eighth-grade girls. 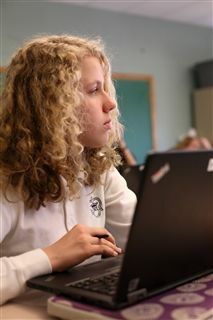 These students experience the environment of an inclusive Upper School (our all-girls middle and high school grades 7-12), and they also know the advantages of a small, student-centered program, which highlights the enthusiasm and special accomplishments of students in the middle-grade years. Faculty in English, foreign language, history and theology have created an integrative program that promotes connections across disciplines and holistic learning. The curricula are coordinated and common projects reinforce important themes. We look at our seventh and eighth grades both as a "head-start" for the college prep high school courses and as a time for a girl's first strides toward the sense of individuality and identity that will be hers in adulthood. Our demanding, but nurturing program in a Catholic environment is designed to foster self-worth, cooperation, accomplishment and a sense of community. Click here to download our Book of Studies for the 2019-20 school year.